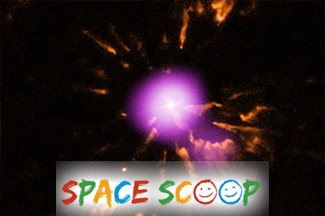 Astronomers have captured a very special event in space: a so-called 'reborn planetary nebula'. This is a gas bubble inside a previously blown bubble, or nebula, like you can see in this image. Most stars turn into a nebula at the end of their lives, and sometimes, like in this case, they do the same thing twice. When a star like our Sun has burned all of its fuel, it expands into an enormous red giant of more than ten times its original size. The star then has trouble holding on to its outer layers, which mostly blows off into space. Meanwhile, the leftover core attacks these loose layers with such intense radiation from the inside that it turns them into a planetary nebula - a colourful shining cloud of gas. 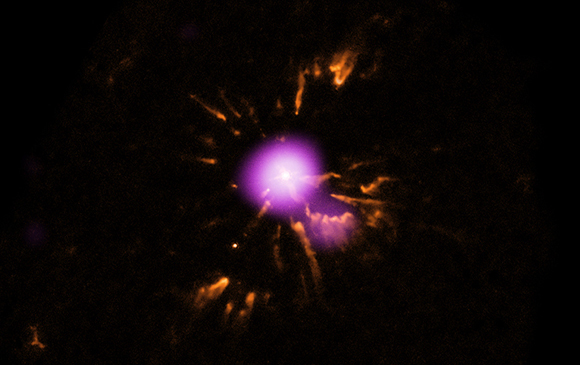 In rare cases, the core then performs the same trick: it expands and turns into a nebula. This time, we call it a 'reborn planetary nebula'. In comparison to a star's lifetime, nebulae (this is the plural word for nebula) last a very short while. They dissolve into space after just a few thousand years. This makes nebulae difficult to spot, and reborn nebulae even more so. Yet this time astronomers managed to catch one on camera! Cool fact: Centuries ago, people thought they were looking at a gas planet when they saw the colourful spectacle of a planetary nebula through a telescope, hence the name.